Archives of Eaton Bray News for August 2013. This article was published in August 2013. Please see Latest News for more recent information. 23 year old Josh Peacock in only his second year of cricket coaching has recently been awarded a Natwest OSCA (Outstanding service to cricket award)) for his outstanding service to youth cricket. Josh, who has been with the club as a player since he was 14, had captained the EBCC Sunday friendly side for the past four years where he has helped bring along the clubs young talent and having enjoyed himself has successfully trained to become a level 2 cricket coach. This season he has managed the U14 development team in the Beds league as well as assisting with the clubs U8's and U10's Wednesday night training along with the other three qualified coaches. He has worked tirelessly to promote Eaton Bray's youth set up which has around 70 children registered and maintains the clubs various social media sites (follow us @EatonBraycc), writes match reports and compiles scorecards. His award will see him go through to a nationwide competition culminating in a fantastic ceremony/dinner held on 30 Sept at Lords cricket ground (where last year the prizes were presented by former England Captain Andrew Strauss and present day player Johnny Bairstow) which he is understandably excited about. 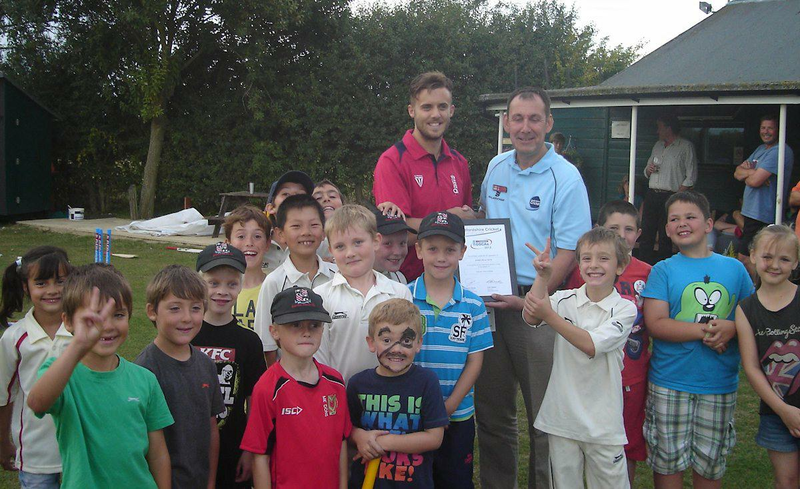 Josh is pictured below collecting his award from Bedfordshire Crickets' Director of Strategy Martin Darlow surrounded by some of the Eaton Bray U10 players. You are viewing the August 2013 archive.